I have a serious love affair with plants. Whenever Meadow or I are feeling down we either head over the the Smith Botanical Garden, into the woods, or to any number of amazing plant nurseries. Plants make people happy, that is a fact! With all the trips to the plant nursery, our plant family has grown and grown and has taken over our house! 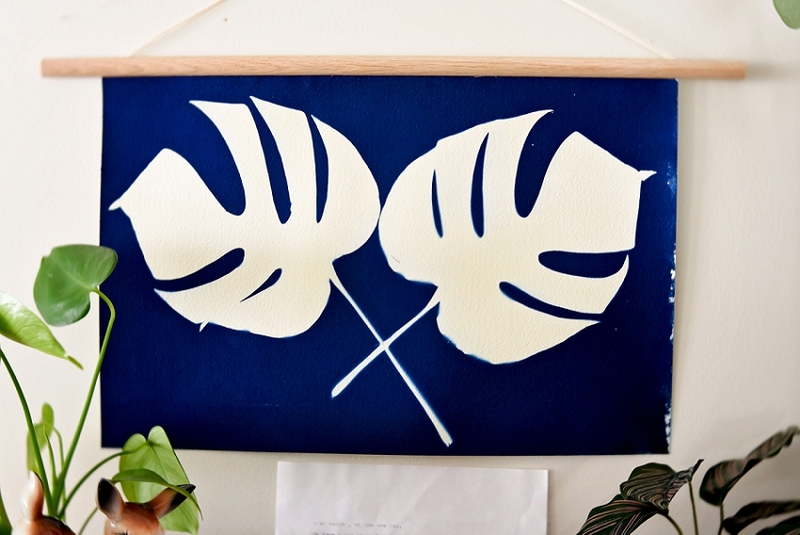 I love love love the look of the Monstera deliciosa plant leaves! They are called Swiss Cheese Plants for a reason! Some of their other common names are Fruit Salad Plant, Fruit Salad Plant and Monster Fruit because when grown in their natural habitat they produce edible fruit. But here in New England we are just lucky enough to be able to keep small versions of this interesting plant alive, but no fruit! 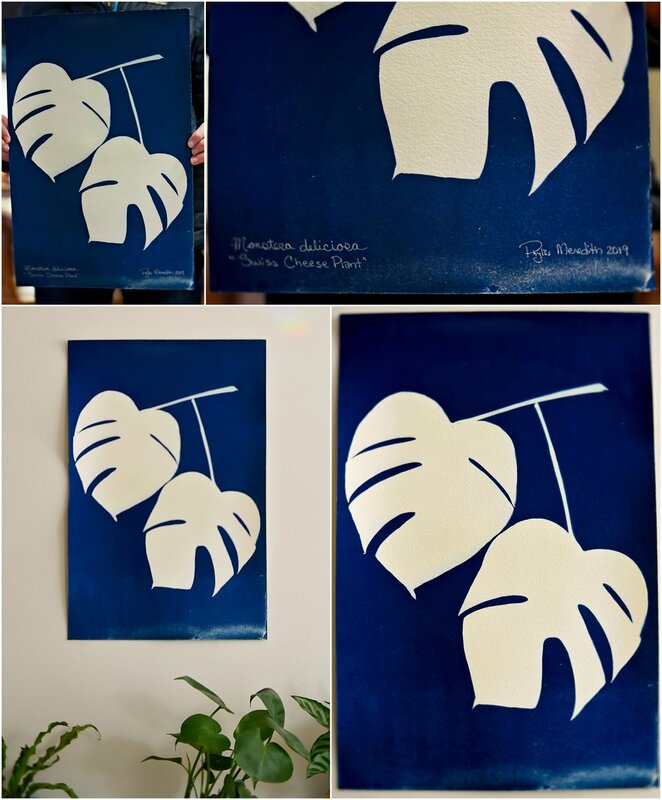 Last weekend I took some of the leaves that had previously been pressing in the basement and created a few Lumen Cyanotypes. I was going to put them up on my Etsy Shop… but they have already found their forever houses, I will make more though! If you are called to have one of these blue beauties on your wall, just let me know, I would love to create one for you. And if you have a special tree that you would like me to immortalize, send me a leaf and I will press it and make you a print! 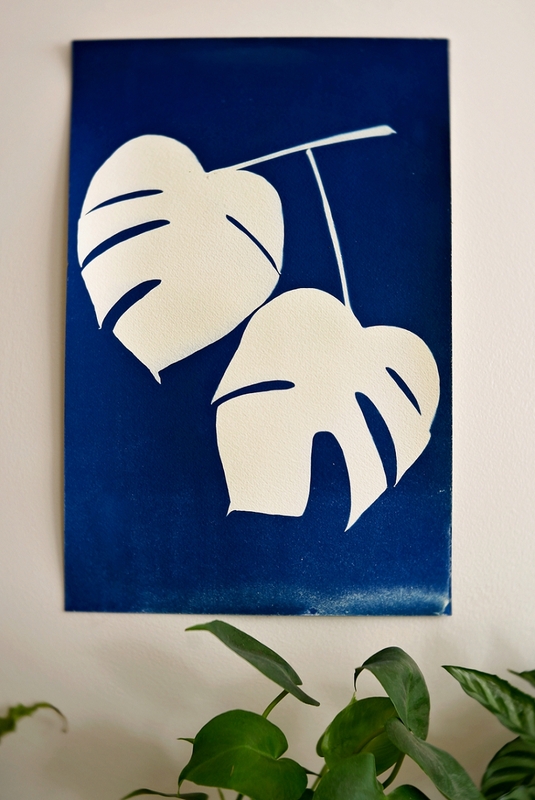 A Cyanotype is an alternative photo printing process that produces a cyan-blue print. Engineers used the process well into the 20th century as a simple and low-cost process to produce copies of drawings, referred to as blueprints. The process uses two chemicals: and creates prints using the sun! The English scientist and astronomer Sir John Herschel discovered the procedure in 1842. Though the process was developed by Herschel, he considered it as mainly a means of reproducing notes and diagrams, as in blueprints. But now it is used by many artists to create beautiful blue prints! A Lunen print is a solar photogram – a camera-less process involving photographic paper, a subject matter that usually (but not always) consists of an organic material, and of course, the most important element – The Sun.